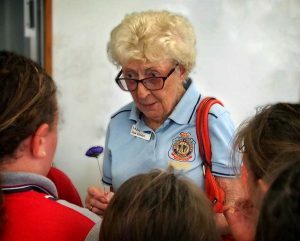 Keeping The Legacy Alive: Melissa Haslam’s photo of Pam Leslie, awarded Life Membership of the RSL QLD Branch was taken with Pam surrounded by the school children at one of her many school visits. Not much taller than the children, Pam is explaining the history of the poppy in preparation for Anzac day last year. It is rare that a life membership is awarded and it is a significant achievement that long-serving Tin Can Bay RSL member, Ms Pam Leslie, deserves. Despite mobility, hearing and vision impairment, Pam is a valuable volunteer who keeps the RSL legacy alive. Congratulations to Pam Leslie, recently awarded Life Membership by the National Board in appreciation of services rendered as a member of the Queensland Branch, The Returned & Services League of Australia. The award recognises Pam’s tireless work and dedication to the RSL and her community. In fact, since 1993, Pam has dedicated her life over her many years of membership to furthering RSL objectives. At 94 years old, Pam’s great passion is still working with the local school where she is loved dearly. She has immersed herself within the school community and ensures that the legacy of our forefathers is not forgotten by the emerging generations. Every year, Pam arranges visits by the school children to the RSL where the children have an opportunity to visit the cenotaph, try on military uniforms, and enjoy hands on access to the memorabilia including the bugles – always a very noisy success! She is very vocal and interactive with the community in respect to the importance of the RSL and its continuance to ensure the sacrifice of generations of service personnel is never forgotten. Additionally, Pam’s fundraising efforts over many years have resulted in significant donations to Legacy. Pam is also an integral part of the planning and execution of the Tin Can Bay school commemorative services, which she attends without fail. She and other local RSL committee members work to ensure there are volunteers in attendance to talk to the children and answer their inquisitive questions in regard to the meaning of, and different parts of the services conducted throughout the community. Pam’s focus has been to foster dignity and honour, improve learning and the ties of friendship between the children and the RSL in general. She protects the good name and preserves the interests of Australian Defence Forces, the sacrifice by our defence members, and the historical significance to our country and its values. Her dedication has had a significant and profound effect on past and present students, a number of whom have gone on the become members of the Defence Force in various capacities. The awarding of Life Membership reflects the selfless dedication and character of this deserving woman.